(May 20, 2015, The Auk: Ornithological Advances)—It takes a lot of nutrients to build an egg. One of the big questions among researchers who study the eggs of migratory birds is where those nutrients come from—does the mother make the egg directly out of what she eats during the breeding season, or does she save up nutrients consumed on her wintering grounds? The answer appears to be both for Common Eiders (Somateria mollissima), large, sea-going ducks that breed in the Arctic. Storing nutrients during the winter and carrying them to the breeding ground is called “capital breeding.” It’s a way around the problem of limited food availability during the short Arctic summer, but the added body weight during migration costs a lot of energy. 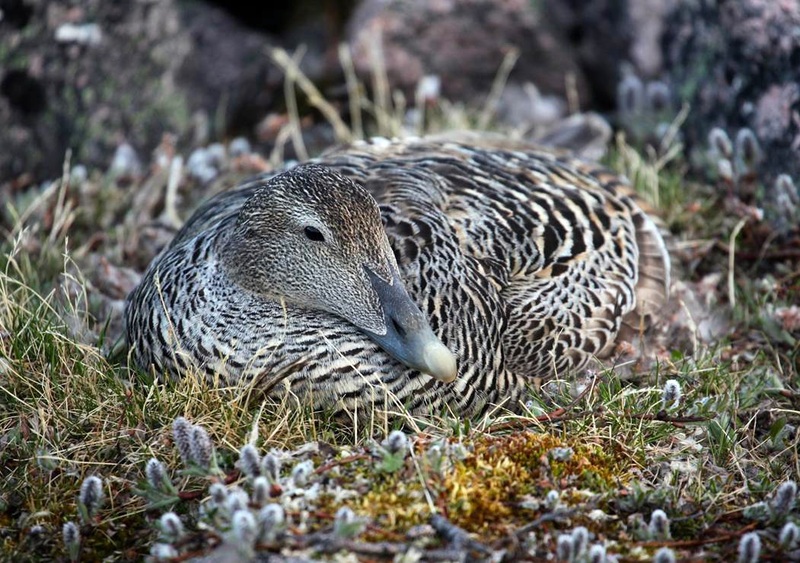 Keith Hobson of Environment Canada and Kim Jaatinen and Markus Öst of Åbo Akademi University analyzed the carbon and nitrogen isotopes found in the eggs of Common Eiders breeding in the northern Baltic to trace the elements in the eggs to their origins. Their results, published this week in The Auk: Ornithological Advances, show that proteins in the egg yolk, which is produced first, include nutrients that originated at the eiders’ wintering ground off the coast of Denmark. However, the albumen or egg white is made almost entirely from nutrients consumed locally on the breeding grounds. The fact that Common Eiders use nutrients from both locations in their eggs means that they are neither true capital breeders nor true “income” breeders, as birds that rely entirely on food sources at their breeding grounds are called, but something in between. “The demonstration that protein in eider egg components comes from different sources makes the capital versus income breeding story much more interesting,” says Robert F. Rockwell, an American Museum of Natural History expert on Arctic waterfowl. Differential contributions of endogenous and exogenous nutrients to egg components in wild Baltic Common Eiders (Somateria mollissima): A test of alternative stable isotope approaches is available at http://www.aoucospubs.org/doi/full/10.1642/AUK-14-294.1. Contact: Keith A. Hobson, keith.hobson@ec.gc.ca.